No one I know likes this ship. This old liner was the TRANSVAAL CASTLE, the last passenger ship built for the famed Union Castle mail run linking Britain and South Africa and the only one-class express liner ever conceived for that historic run. International politics played an increasing role in the life of the service and after South Africa pulled out of the British Commonwealth the government in Pretoria put greater stock in the enlargement of a South African merchant marine. In mid decade they "suggested" that Union Castle transfer two passenger ships to South African flag SAFMARINE. Union Castle, whose sole business by then was the South Africa run, could not but comply and arranged to sell two ships to the South Africans... This was one of them, the other was the PRETORIA CASTLE...That ship was renamed S.A. ORANJE and this one became S.A. VAAL. That done, both ships retained their Union Castle crews and continued in operation exactly as before though now wearing the white hulls of their new owners. 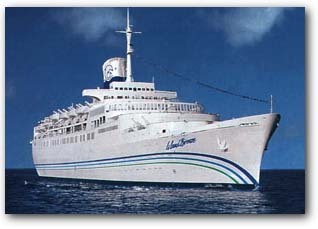 By the mid 1970s the fleet was down to five passenger liners plus the unattractive tourist class cruiser REINA del MAR which made a very few line voyages between Britain and South Africa. The mail route was costing too much money to operate so Union Castle and Safmarine agreed to close it down. Only one of the six ships ever traded again...the S.A. VAAL. The larger flagship WINDSOR CASTLE found a buyer in Greek John Latsis but he has employed her only as a floating hotel in Saudi waters. The others all went for scrap...some sooner than others. Carnival Cruise Lines bought the S.A. VAAL in late 1977 or early 1978 and sent her to Japan where and when $20 million could buy you a conversion to a pretty decent, large cruise liner for the American market. She began cruising in October 1978 from Miami as FESTIVALE and when superseded by new "Fun Ships" a few years later, she was sent to work on 7 day cruises from San Juan. The winter of 1996 saw her turned over to Dolphin/Premier Cruise Lines on a bareboat charter. That firm renamed her ISLAND BREEZE and painted her in their livery. 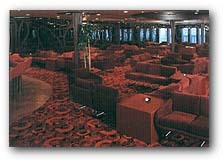 While there are MANY public rooms ranging from the LARGE Copacabana Lounge where shows are done at night to incredibly ugly and windowless Le Cabaret Night Club (of which the ship's Chief Purser said during a pre maiden voyage walk through in 1978 - "This room - OFF the ship" the ship's public rooms were largely uninviting by day even when it was too cold to spend much time on the ship's admittedly expansive open deck areas. Only the casino and the adjoining cocktail lounge (ALSO fitted with gaming equipment) drew crowds by day - The ship has a cinema and a very small gym plus a very dark disco for late night revelling. Breakfast, Lunch and Dinner are served in two sittings in the 700 seat Continental Dining Room. So, too is the midnight buffet - but if you go down for a snack be prepared for an employee to gruffly tell you where to sit. Dolphin/Premier Cruise Lines brochures tout both "white glove service" and award winning food....I guess the gloves are rubber and the award winning food...well I can't imagine what they are talking about, for on none of my several cruises in Dolphin/Premier ships was the food memorable...bland, yes, uninteresting yes, but good...no. I guess it's all a matter of what you're used to and a case of definition. Dolphin/Premier's excuse this time is that Carnival retained the food and beverage services as well as the casino in this ship. "Alternate dining" if you can call the hot dogs, hamburgers and other very cheap fare "served" topsides "dining" is available in the 196 seat Lido Bar and Grill....since most passengers opt to take lunch up there...I leave it to you to imagine the crush of humanity when the ship is running with the 1,400 she can take. 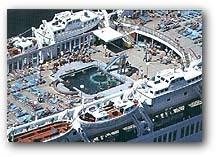 Using the tried and true Miami cruise line formula the ISLAND BREEZE has the usual cruise ship entertainment options. I found nothing special in this department. Drinking and gambling were VERY popular with many of the people on my sailing but since I hardly ever play and I don't drink, I can't really guide you there. Careful when you order drinks - I noticed drink waiters and waitresses invariably answered drink orders with libations in those tall souvenir hurricane glasses, so they could charge and garner the requisite 15% gratuity - specify the size of your drink when ordering, or prepare to pay about $6.00 per drink. That's what these shoe-box apperturances fitted with beds on either side of a wash basin (in MOST categories) are called. Small and unimaginatively fitted to downright UGLY, they are so far below today's standard that I prefer not to comment further than say: "Just wait till you see those late 1970's colored placards bedecked with "deep thoughts" adorning cabin walls. Protected under plastic, they are a real souvenir of the years of the Ford administration, or the Brady Bunch. From Montego Bay on 7 night cruises to the Panama canal in winter and from May 2 night and 5 night cruises from New York. No ship is for all passengers and this is one I did not like. Accompanying us on this cruise was an eager first time passenger who liked the cruise but shared my low opinion of the aging vessel. I doubt that experienced cruise passengers will be kindly disposed towards this vessel. My big ears overheard many, many grumblings and screechy complaints. Let's be honest...the New York market is tough and Doplhin Cruise Lines is very new there. I'd say they have their work cut out for them. I don't expect their winter cruises from Montego Bay to be much easier for them either since they are priced so very low they will undoubtedly attract people who expect a real cruise for that price. I had much wanted to do a 5 night cruise on the ISLAND BREEZE for the following reasons: I like ships. I like sailing from New York. I like the itinerary. I liked the price. Before sailing on my 5 night New England/Canada cruise in the ISLAND BREEZE I stopped into five New York City travel agencies to ask what they had heard about her. I introduced myself to them as a travel writer. Not a single one of those agents had as much as the brochure for those trips. The only agent who had heard of her had been aboard and he gave her a vote of no confidence. She has a lot of deck space, though some of the best spots are unusable because of crowding near the Lido Grill and the decibel level of the otherwise competent Caribbean musicians). My Indonesian dining room waiter and a couple of other crew members. The ports. I really like Halifax and Portland. The cruise fare. Let's face it...it's cheap...and at a "two for one" price at that. The decor...most of it is dark, dated, dingy and worn...a couple of orange colored rooms are awful. I found all of it frankly UGLY so if your surroundings are important to you as they are to me.. you won't like this ship. The smell. I no longer smoke so my sense of smell has returned and to me this old ship reeked of mold, mildew and stale tobacco. I had failed to bring a nose clip so I was put off by it. My cabin. Overlooking covered promenade deck and called a "suite" by the line, it was nothing more than a dark room with two twin beds and one uncomfortable chair... An uglier room I can not imagine, badly furnished and cheaply done. It reminded me of Mr. Skinner's motel in an "I Love Lucy" episode. Never mind that for two days the room was chilled as if by refrigeration...I also didn't much like the occasional discharge of pellets of dirt from the ceiling mounted air conditioning vent. The regimentation common to the budget lines which understandably cater to the lowest common denominator, so if you go, prepare to be told where to take your buffet plate and sit among strangers who don't want to meet you (and you might not want to meet them). I'm also puzzled by the constant muzak everywhere on deck and in some interior public areas. An unwillingness to deal with anything like a new idea or a concept contrary to what they are trained to expect put me at odds with some of the Pursers who have never learned that NO CREW MEMBER HAS EVER WON AN ARGUMENT WITH A PASSENGER. The sense of crowding. Big as she is, the ship felt crowded. One example - Unable to handle over 1,000 passengers at a lunch buffet is the lido grill. There aren't enough tables or chairs for the demand. The rate of exchange. When it all begins to go wrong, cut your losses. I should have known better when boredom sent me to the casino to play the slots. I put a $20 in an automatic change machine and got $9.25 back. It took 20 minutes to recoup my $20 bill and another ten to get change from the cashier. It only took 6 minutes to lose the $20.00 in the machines. Never mind how cold the ship was for two whole days and nights. In my midships Veranda Deck cabin I felt a continuous engine vibration whenever we were underway. If money is a MAJOR constraint and you have a yen to do a cruise...this ship is a bargain but remember...you get what you pay for and I found her dirty, smelly and so far below the minimum standards you can get for about a hundred dollars more per person, I cannot recommend this ship for any reason. But if you are impressed by the line's rock bargain basement prices and won't object to the company's operating style - you WON'T be permitted to get your cabin key until you fork over either a cash deposit or a credit card for an imprint - give her a try. You aren't me so you might like her. I didn't.